Introduction – History of Thirumayam is probably traceable from early seventh century when the town was immortalized with the construction of a Vishnu cave temple. After a short period, a cave temple for Shiva was also constructed hence making this town to be revered by Vaishnavas and Shaivas equally. There is no consensus among the scholars about which one of the cave temples was constructed first. I have taken the view supporting the Vishnu temple however this will be dealt in detail later in the article. Existence of the Pallava Grantha inscriptions in the Shiva cave temple suggests that the town was under Pallavas through their vassals, Muttaraiyar, perhaps. Though the Pallava territory was restricted to Trichy during the reign of Mahendravarman I (580-629 CE) but the Pallava-s gained northern part of the Pandya land during the reign of Nandivarman II Pallavamalla (731-796 CE). An inscription of the mother of a Muttaraiya chief in the Vishnu cave temple supports this view. Thirumangai Alvar, and eighth century Vaishnava saint, praised the Lord of Thirumayam in his hymns and included it under the hundred and eight divya-sthalas for the Vaishnavas. This started the foundation of Vaishnava tradition in Thirumayam. Pandya-s gained their land back from the Pallava-s soon. Thirumayam came under the the Chola-s when the wiped off the Pandya-s from Tamil landscape. Many inscriptions of the Chola-s in Thirumayam suggest that the town got its due attention from the Chola rulers as well. With the Pandya resurgence, Chola rule was ended and Thirumayam again came back to its original occupants. Inscriptions of Maravarman Sundara Pandya II reflects the attention given to this town just after he finished with the Chola problem. Pandya inscriptions of Sundara Pandya, Vira Pandya and Parakrama Pandya suggests that this town was under them for quite some time. Having a Shiva and a Vishnu temple at the same site put Thirumayam under religious conflicts. A long inscription is found which details about the settlement reached to avoid further conflict in between these two sects. This meeting was presided by a Hoysala army chief and the inscription is dated under seventh regnal year of Sundara Pandya II. This suggests that either the town was under influence of the Hoysala-s or they helped Sundara Pandya in his wars against the Cholas achieving a commendable position under the Pandya-s. The inscription suggests that there were earlier incidents of clashes between these two sects at the site which resulted in some demolition of temple properties. However after the settlement was reached all conflicts were resolved without further clashes. After the Pandya-s, Vijayanagara rulers enjoyed command over this town. The Vijayanagara inscriptions are dated in the reigns of Virupaksha I and Krishnadeva-raya (15th-16th century CE). Where the Pandya records are only found in Shiva temple, they seemed to have neglected the Vishnu temple, Vijayanagara rulers supported both the temples in ratio of 3:2 for the Vishnu and Shiva temple. Though they favored the Vishnu temple but they did not neglected the Shiva temple. After the Vijayanagara rulers, Pudukkottai Nayaka-s were in possession of the town. Setupathi Vijaya Raghunatha Tevan of Ramanathapuram was ruling over Thirumayam during later seventeenth century and he constructed a fort here. He gifted this fort to Tondaiman rulers of Pudukkottai for helping him winning Ramanathapuram from his rivals. Tondaiman king submitted to East India Company’s claim for the fort and Thirumayam went to the British under the Princely State of Pudukkottai. At present Thirumayam is a taluk under Pudukkottai district and a revered place for the Vaishnavas. Monuments – There are three monuments of interest in Thirumayam, Thirumayam Fort, Shiva cave temple locally known as Satyagirisvara Temple and Vishnu cave temple known as Satyamurti Perumal Temple. Satyamurti Perumal Temple – Satyamurti Perumal Temple is a cave temple dedicated to Vishnu who is present in his Anantasayana (reclining) form. I feel that this Anantasayana image is perhaps the best representation of this icon among all others. This colossus image is about 9 meters long covering the whole area of the cave. Vishnu is shown recumbent of Adi-Sesa (mythological serpent) coil facing south with his head in west and legs stretched out to east. He is surrounded by many deities. Brahma, seated on a lotus, emerges out of his naval. Lakshmi is shown seated near his chest while Bhu-devi is near his feat. Near Brahma are shown Sapta-rishis (seven saints). Garuda is shown standing behind Sesa. Two demons, Madhu and Kaitabha, are standing near his feet ready to attack him. Vishnu’s weapons Sudarshan Chakra (discus), Panchjanya Shankha (conch), Nandaka (sword) and Kaumaudiki (club) are shown flying towards Madhu and Kaitabha to defend the attack. Adi-Sesa spits fire from his hoods to scare the demons. The fire blocks moving towards the demons are very nicely carved on the back wall. K R Srinivasan suggests that this image of reclining Vishnu was hypaethral (open cave) which was later converted into a cave temple by addition of façade pillars and other features by a queen of Muttaraiyar origin. V Latha infers a similarity of this cave with open grotto image of Vishnu at Udaigiri Caves of the Gupta origin. As the inscription of Muttaraiya lady talks about renovation which suggests that the cave was already in existence. This inscription is dated to second half of eight century by T V Mahalingam however V Latha writes that it is dated to later half of seventh century. She further states that if a temple needs a renovation then it could be estimated that the temple is at least 100 years old. Hence this cave would have been excavated in middle of sixth century. This is well before the time when the Pallava king Mahendravarman I (580-629 CE) started with his cave excavations at Mandagapattu which as per K R Srinivasan is the first such specimen ever tried in Tamilnadu. There is an old debate among the scholars whether Mandagapattu was the first cave of Tamilnadu or not. Raju Kalidos, V Latha, R K K Rajarajan and S Gopalakrishnan are of the opinion that cave temple as an art was in existence well before the Pallava-s in Pandya region. Raju Kalidos has shown similarities between the Gupta caves of Udaigiri and caves of Pandya region. These similarities are seen in the iconography icons and cave excavation styles. G-Jouveau Dubreuil while describing Adi-Varaha Perumal Cave Temple at Mahabalipuram suggested that this temple may have been started during the time of the Pallava king Simhavishnu (550-580 CE), father of Mahendravarman I. Still there is no consensus on the Mandagapattu riddle among the scholars. In the case of Vishnu temple at Thirumayam, there are two opinions on dating of the Muttaraiya inscription as seen above. ASI (Archaeological Survey of India) on this cave temple states that Sattan Maran (Videlvidugu Viluperadiaraiyan), the Muttaraiya chief whose mother carried out renovations, was a contemporary and vassal of Pallava king Nandivarman II Pallavamalla (731-796 CE) thus supports dating of T V Mahalingam. I am not in capacity to clarify any further on this till there is a clarity from where V Latha got the dating of this inscription to later seventh century. If someone can lay hands on ‘Inscriptions of Pudukkottai State’ journals then original dating of this inscription can be verified. Originally excavated as an open cave, it was fitted with a mandapa in a span of 100-120 years and thus started the journey of an amazing temple. Thirumangai Alvar referred it as Meyyamalaiyan in his hymns. After the donative records of eight century, the next available inscription is of 12th century CE hence history of about 400 years is missing. Later inscriptions talk about few edifices like temple tank etc which were not talked in the earlier inscriptions. Hence these could be the constructions done during those 400 years. The present form of the temple was taken during Vijayanagara rule when they constructed various separate shrines and gopurams. There is a mandapa constructed in front of the original cave with its extended small mandapa. On left of this large mandapa is a separate shrine for Vishnu as Satyamurti. Near this shrine are shrines for Visvaksena and Rama. There are many other small shrines all around the compound. The current name of the temple, Satyamurti Perumal Temple, is not how it was called in earlier days. The lord is referred as Pallikontarulina Alvar and Alakiyameyyar in earlier inscriptions. The name Satyamurti might have been popular after it was referred by Thirumangai Alvar as Thiru-meyyamalaiyalan which translates to ‘The Lord of Truth’ which is same as the translation of Sanskrit word Satyamurti. It is very probable that this name, Satyamurti, came into existence during the Vijayanagara rule. 1. No 402 of the Annual Report on Epigraphy/No 13 of the Inscriptions of the Pudukkottai State – Found on a parapet slab in the west parakara (complex boundary) of the central shrine of Satyamurti – Written in 11 lines in Tamil – dated about second half of the eighth century CE – Records a renovation, probably of the temple, by a lady named Perubidugu Perundevi who was the mother of Videlvidugu Vilupperadiaraisan alias Sattan Maran and the gift of lands in Andakuddi, including the cultivation and proprietorship rights to the central shrine (unnaligaippuram) of the temple. 3. No 405 of the Annual Report on Epigraphy, 1906 – Found on west wall of the Satyanarayana-Perumal temple – Written in Tamil but stones are not in original order of the inscription – dated in 26th regnal year of Kulasekharadeva Pandya – Registers gift of land mentioning the name of the temple as Kandideva Vinnagar Emberuman. Satyagirisvara Temple – K R Srinivasan suggests that the Shiva cave was earlier than the Vishnu cave however V Latha states otherwise. K R Srinivasan’s claim might be due to the presence of musical inscription, now mostly obliterated, written in the Pallava Grantha script similar to the celebrated musical inscription of Kudumiyanmalai. The inscription of Kudumiyanmalai has been associated to the Pallava king Mahendravarman I by many scholars including C Minakshi however there is no consensus over this among the community. However K R Srinivasan did not associate this cave with the Pallava-s but states that this is an excavation of Muttaraiya-s/Pandya-s. Fortunately here we did not see any clash and the cave is associated with the Pandya-s by most scholars. The current name of the temple, Satyagirisvara, seems to be influenced from the Vishnu cave temple at the same site. The lord is referred as Nayanar Thirumeyyamalaiyalan and Thirumeyyattu–mahadevar in its inscriptions and no where we find reference as Satyagirisvara. As we will see later, that the Vaishnavas got preference over the Shaivas, so it is more likely that the name of the lord of this cave temple got influenced from the prominent sect’s god, Satyamurti. This rectangular cave faces south with a cell carved in its west lateral side. With this cell in west the sanctum faces east. It is generally assumed that cells in lateral walls were in fashion among the Pandya-s and Muttaraiya-s but not with the Pallava-s. However we have few Pallava cave temples where the main cell is carved in a lateral wall for example the Upper Cave Temple at Trichy. V Latha suggests that it is very possible that the Pallava architects followed this lateral wall cell style of the Pandya-s as Lower Cave Temple at Trichy is supposedly of the Pandya origin and has two cells in its each lateral walls. However it is very hard to substantiate this claim as no inscription is found at the Lower Cave Temple and it is assumed as a later excavation in comparison to the Upper Cave Temple by many scholars. The mandapa has two pillars of characteristics Mahendra-order, with cubical base and top and octagonal shaft in middle. The cell is excavated little higher than the ground floor so that to rise the sanctum sanctorum. Inside the cell is a Shiva lingam carved out of mother rock, a characteristic feature of the Muttaraiya and Pandya style. V Latha draws a connection here between the Gupta style and the Pandya style. Monolithic lingas are absent in the Pallava cave temples however these are very much present in the Gupta and the Pandya caves. She further suggests that probably the Pandya-s got the inspiration from the Gupta-s hence they were the first to cut cave shrines in Tamilnadu, even before the Pallava-s.
On either side of the cell are dvarpala-s. K R Srinivasan suggests that one of the dvarapala is a portrait sculpture of a chief or king, however it seems that he is probably not very correct in his statement. Both the dvarapala-s are representation of the ayudha-purusha of Shiva’s weapons. Dr Gift Siromoney has provided details about such representations of dvarpala-s in the times of the Pallava-s. This style is followed by their vassals, the Muttaraiya-s, as well as we have seen similar dvarapala representation in Kunnandarkoil Cave Temple. Right side dvarpala represents Trisula (trident) as evident by two protruding prongs out of his head on either side and one protruding prong from above his head. This representation was wrongly taken as the representation of Nandi by earlier scholars till Dr Gift Siromoney came up with his theory of ayudha-purusha-s as dvarapala-s. The dvarapala on left, which was misinterpreted as a chief or king by K R Srinivasan, is a representation of parasu (axe). There is a protruding axe blade from above his head. Though this dvarapala is not a very good example of axe blade representation however there are other better examples seen elsewhere. Refer PoetryInStone.in for complete understanding about ayudha-purusha-s as dvarapala-s.
On the eastern lateral wall, a colossus Lingodbhavamurti is carved. The lingam is well rooted with the base and also with the roof of the mandapa. In between is an image of Shiva as Chandrasekhara. However there is no Brahma and Vishnu seen on this image. The story behind Lingodbhava in nutshell glorifies the superiority of Shiva among the Hindu Trinity, above Brahma and Vishnu. Once upon a time, Brahma and Vishnu sees an endless fire and they decided amongst themselves that whoever will find the end of this fire will be superior. Brahma took form of a swan and started flying upwards while Vishnu took form of a boar and started digging earth to move downwards. But both failed to reach the end of that great fire. At last Shiva appeared out of that fire and proved that he is superiors above the other two. One question always confuses me that why we worship linga or symbol of phallus. Sometimes I think that we do not worship a symbol of phallus but the endless fire which is depicted in form of a linga. Probably the symbol of worship was never in the form of a linga in the earlier times and the linga we see now is a corruption of that earlier symbol. But this can just be a thinking of my Hindu mind as I feel to get disassociate from phallus worshiping sect. May be more study is needed to understand linga worship and probably my mind is not adequate enough to understand the spiritual and mental philosophy behind this symbol. Beyond the cave temple, its pillared mandapa, various extensions were made in later years. All the extensions were made in South leading to a gopuram which marks the current boundary of the temple and serves as the main entrance into the temple. There is a big mandapa constructed in front of original cave mandapa. A separate shrine for goddess Venu-vanesvari is constructed just opposite to the cave temple. This shrine has a cell and a mandapa in front. 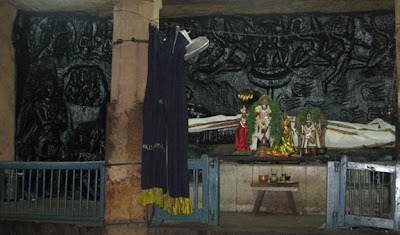 On the eastern side of the big mandapa are two separate shrine, one for Rajarajesvari and another for Bhairava. There are many other small shrines in the complex. On the east end of the temple complex, a wall has been raised which demarks the Shiva temple and the Vishnu temple. It seems that Thirumayam went under a long feud between the two rival sects, the Vaishnavas and the Shaivas. As temples of both the sects were constructed side by side so there was always fight about the boundaries. A long inscription, found in Satyagirisvara Temple, provides details about a settlement which was reached between these two sects in the reign of the Pandya king Maravarman Sundara Pandya II. The agreement was presided by a Hoysala chief, Appanna Dandanayaka. In this settlement three-fifth of the land was given to the Vaishnavas and two-fifth to the Shaivas. They were asked to mark their boundary with stones, tirisulakkal (stone of trisula) and tiruvalikkal (stone of chakra). Instead of these stones there is a permanent boundary now. 1. No 5 of the Inscriptions of the Pudukkottai State – Found on north wall of the cave – Written in Sanskrit and Tamil using Pallava Granta and Tamil script – dated to seventh century CE – This record is a duplicate of one at Malaykoyil. This gives directions for learning to play the musical instrument parivadini (a seven stringed lute) and praises the divine qualities of the instrument. 2. No 386 of the Annual Report on Epigraphy 1906 and No 7-A South Indian Inscriptions Vol XII – On north and south wall of the cave – Written in Sanskrit using Pallava Grantha script – dated to seventh century CE – From the preserved portion, the names of musical notes such as gandharam, panchmam, dhaivatam, nishadam etc can be read. A certain order is noticeable in the arrangement of the notes in seven sections with sub-sections. Unfortunately the sub-sections have been erased as to make it impossible to follow the method adopted here. This record could be the exact copy of the celebrated musical inscription found at Kudumiyanmalai. As the paleography of the inscription resembles to that of Kudumiyanmalai so this inscription can be attributed to the Pallava king Mahendravarman I. 5. No 387 of the Annual Report on Epigraphy and No 340 of the Inscriptions of the Pudukkottai State – South side of the cave mandapa – Written in Tamil in 47 lines – dated to 7th May, 1245 in the seventh regnal year of the Pandya king Maravarman Sundara Pandya II – This long record enumerates the various points of settlement arrived at, by a grand assembly comprising of the nadus, the nagarams, the villages and the samaya-mantris of Kana-nadu alias Virudaraja-bhayankara-valanadu, the Araiyakal who policed the nadu and the sri-rudramahesvara of the same nadu, Nalladariyum-perumal Iravanamudaliyar, Tavalaikoyil-vasar-picchamudaliyar, and the sri-vaishnavas of the Pandi-nadu, srivaishnavas and srimahesvaras of Thirumeyyam, srirudra srimahesvara of the temple of Thirukkodungunram in Thirumalai-nadu and the vaishnavas Anusantanam of the same nadu in the presence of Appanna Dandanayakkar, the brother-in-law of Ravidevar Dandanayakkar who was one of the Dandanayakkar of Hoysala Vera Somesvara. The first item of the settlement was about the long standing quarrel concerned with the sharing of the kadamai due from the village, between the Shiva and Vaishnava temples of the village. It was resolved that two-fifths of the kadamai should go to the Shiva temple and the remaining to the Vaishnava temples. The other items: a mutual exchange of devadana lands of the two temples, the compound wall common to the both temples, the fixation of the boundaries by tiruchchulakkal and tiruvalikkal, the sharing of tank and a well, the lands belonging to each temple, the habitation sites belonging to the two temples, the proprietary rights of the individuals and the erasure and re-engraving of old inscription of both the temples. Many officials attest the record. The record erased to engrave this settlement was the old Pallava Grantha musical inscription. 8. No 389 of the Annual Report on Epigraphy and No 467 of the Inscriptions of the Pudukkottai State – At right side entrance to the cave temple – Written in Tamil – dates to eighth regnal year of the Pandya king Maravarman Sundara Pandya II – Seems to record a grant of land by the assembly at Thirumeyyam, a devadana and brahmadeya of Kana-nadu, instead of the paddy, due from then to the temple, on account of their having received 10 palankasu given to the temple by Imjiratuvdaiyan, one of the samantars of Rajarajadeva. 9. No 388 of the Annual Report on Epigraphy and No 472 of the Inscriptions of the Pudukkottai State – South wall of the cave temple – Written in Tamil in 44 lines – dated to eleventh regnal year of the Pandya king Maravarman Sundara Pandya II – Records a gift of land for uvachchu (drummer) service in the temple by the assembly of Thirumeyyam a devadana and brahmadeya of Kana-nadu aloas Virudarajabhayankara-valanadu. Mentions that the above land was set apart for the same service by Thiruvengadattu Nambi when he was chosen as referee immediately after the settlement of the dispute between the Vaishnavas and the Shaivas. Thirumayam Fort – This fort was built by Sethupati Vijaya Raghunatha Tevan (1663-1708) of Ramanathapuram. He is popularly known as Kilavan Sethupati also. This fortification of the town was probably done after the fall of Vijayanagara rule from Thirumayam. Originally constructed with seven concentric walls, only three enclosures remain now. After Ragunatha Tevan, the fort went into the control of the Tondaiman rulers of Pudukkottai when Raghunatha Tevan gifted this fort and Thirumayam to his brother-in-law, Raghunatha Raya Tondaiman, the first king of Tonadaiman clan. The fort is very small and not many bastions are seen. There is one bastion on top of the hill where as canon of British origin is placed now. It is believed that Thirumayam fort was one of the recluse for the Tondaiman rulers during their bad times when Thanjavur general, Ananda Rao, ran over most of their territory leaving only small area in and around Thirumayam. Local guide will tell you an unconfirmed story of Katta-bomman and his brother Oomayam who held this fort against the British. This fort is locally known as Oomayam Kottai, the fort of the dumb, dumb refers here to Oomayam who fought against the British and was executed later on. There is a small cave temple of grotto style inside the fort. The cave is composed of a single cell excavated into a rock and dedicated to Shiva. A Shiva linga is carved inside out of the parent rock inside the cell. The base of this linga is square instead of regular circular base. Entrance of the cell has been carved like door with pilasters and lintel. How to Reach – Thirumayam is about 20 km from Pudukkottai town lying on Trichy-Rameshvaram national highway no 210. It is well connected to Pudukkottai and Trichy via rail and road. The nearest airport is at Trichy. Ayyar, V Venkatasubba (1943). South Indian Inscriptions Vol XII. Madras. Archaeological Survey of India. Mahalingam, T V (1991). A Topographical List of Inscriptions in the Tamilnadu and Kerala States Vol VI. New Delhi. S Chand & Company Ltd.